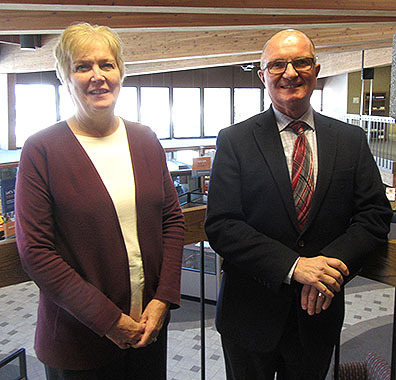 Photo by JIm Muchlinski Bremer Bank recently recognized the retirements of mortgage lender Deb Blomme and Vice President of Bremer Investments Mark Buss. Combined, the two worked for Bremer Bank for 71 years. MARSHALL — Seventy-one years worth of Bremer Bank experience concluded last week with a Thursday afternoon retirement party. Mortgage lender Deb Blomme and Vice President of Bremer Investments Mark Buss are retiring after spending all of nearly all of their careers at Bremer’s Marshall location. The public was invited to attend. Both positions have already been filled, with Hayley Fruin taking over for Blomme and Ryan Serreyn succeeding Buss. Fruin and Serreyn have already been getting side-by-side instruction in their new roles, which should ensure smooth transitions. 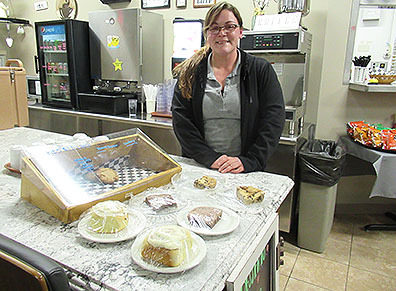 Blomme, a graduate of Marshall High School and Southwest Minnesota State University, began her employment at Bremer as a consumer lender. After two years, she was promoted to real estate lender, a role she has played at Bremer ever since. Her husband, Bill, works as both a farmer and tax accountant. They have two children, Kristin (Hanson) and Ben. She started in mortgage lending when interest rates were extremely high during the early 1980s recession. While certificate of deposit holders could have double digit annual returns, those needing to borrow money to buy a house faced interest rates of about 16 to 17 percent. As a result, she had very little lending activity until rates began to come down. Since then, she has seen firsthand how home buying opportunities depend greatly on the overall national economy. To qualify for a mortgage, the traditional standard has been to allow up to 28 percent of the buyer’s income to go toward mortgage debt. Blomme said the 36 percent guideline for maximum total debt can be stretched up to a point on the lender’s discretion if the buyer has enough earning power and cash on hand. She added that one of the first questions all real estate agents ask prospective buyers is if they’ve been to a bank. The pre-qualification process for mortgage loans greatly reduces the chance of making an agreement to buy a house and then having to cancel it under a finance contingency for not being able to get enough of a loan. The Home Stretch education class offered through the Southwest Minnesota Housing Partnership is another tool for deciding how to structure a home purchase. It is highly recommended for first-time home buyers. She said mortgage lenders can benefit from repeat business in several ways. They include refinancing to reduce an interest rate, buying a home again after a first time, or choosing a lender based on recommendations from a family member or seller. The greatest fringe benefit, however, comes from the enthusiasm often shown by first-time buyers who’ve looked forward to being able to enjoy a first home of their own. Buss followed in the footsteps of his father and uncle by entering the banking business after graduation from Gustavus Adolphus College in St. Peter. His first boss, Roger Tjosaas, had previously worked in the same bank as his father in the late 1960s. 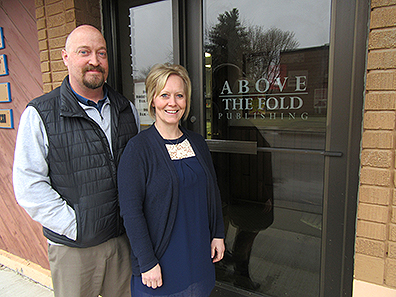 His career path at first took him from his hometown of Owatonna to Lakefield for six years. He then accepted a position at Bremer Bank in Marshall. As part of his years at Bremer, he has served as a vice president in three different departments. The first in the business banking department was followed by the same position in Retail Banking. He moved to his third and last vice presidency in Bremer investments in 2006. He said he looks back favorably on all of his Bremer experiences, and that a main reason is continuous support from his own department and others facets of Bremer’s Marshall operations. He also pointed to family support. He and his wife, Chris Anderson who works at Southwest Minnesota State University, have a combined five children and five grandchildren. He said the overall investment strategy doesn’t totally depend on the client’s age or income. Instead it depends on priorities in life, where each person wants to be in the next few years as well as the more distant future. Another factor is how much risk an investor is inclined to tolerate. “There’s a wide range when it comes to risk,” he said. “I’ve had some clients who’ve heard about a rate of 15 percent or more even in a low-interest market and want a way to capture it. Others don’t want to consider anything that includes average or above-average risk with their principal (money invested at the start). Without trying to coax investors in either direction, Buss said he tries to clearly convey the potential consequence of choosing either extreme. For higher risk there’s a possibility of a sizable net loss from an economic downturn. On the other hand, staying entirely safe might mean a lost opportunity to earn much more of an investment income. He said daily professional research for an investment adviser should include all major sources of investment information. It should also involve attention to a variety of media outlets since they frequently make different interpretations of economic news. His greatest reward has involved seeing a client’s portfolio thrive over the course of a lifetime in a way that remains strong as they enter life’s different stages.